I arrived in Panama City on the 18th of April by bus at Albrook Mall and had to talk to about five different cab drivers that would take me to the Amador for less than $5. The Amador is a causeway that jets out connecting three islands off the east side of the entrance of the Canal on the Pacific Ocean. Karaka was anchored as close as possible to the messed up dingy dock off the second island on the Amador, Isla Pericos. The dingy dock was broken so there was a crappy little red plastic boat with a crappy dirty string on a pully to get across to the wet slippery steps everytime we went to and from the shore to the boat. 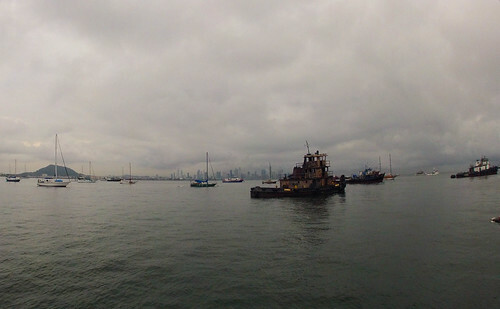 The water in the harbour was very disgusting with all sorts of things floating by, as soon as it touched your hands you felt like having a shower. Lots was going on, making bags for kayaks, putting more puddy on the deck, lots of time on internet, making space for all our provisions, cleaning buckets, and of course fixing some of the many things that need fixing on Karaka. So the crew changed quite a bit since we had arrived in Costa Rica at the end of January. Simon and Cesar were both long gone back to their homes, Tara had flown back to the US for a job, and Eric had continued his travels north through central America. Unfortunately Kim’s dad was not doing too well so she is staying in Australia with him and not joining us again until sometime later in Polynesia. There was also Benedict from Germany and Marta from Spain who had been crewing on Karaka during my absence between Northern Costa Rica and Panama City but had left before I made my way back. Pam, is a tattoo artist from the east coast of Canada. She joined Karaka a few days after I left in February. She had been in contact with Tom for a while and heard about Karaka from a good friend of hers who was a past crewmember. Michaela, from New Zealand who sailed down the coast of Central America on a 23ft sailboat named Medusa with her other Kiwi friend Naomi. I actually connected with Naomi through couchsurfing while looking for a place to stay in San Juan del Sur in Nicaragua at the end of January. I told them about Karaka and how we were in Playas del Coco in Northern Costa Rica and should all connect. Unfortunately I left for work in Panama just before they arrived in Coco with the Karaka crew. I heard they had a good bunch of parties and good times. Naomi ended up selling the boat in Tamarindo, Costa Rica and Michaela decided to come join Karaka for the passage to the Polynesia at the beginning of April in Panama City. 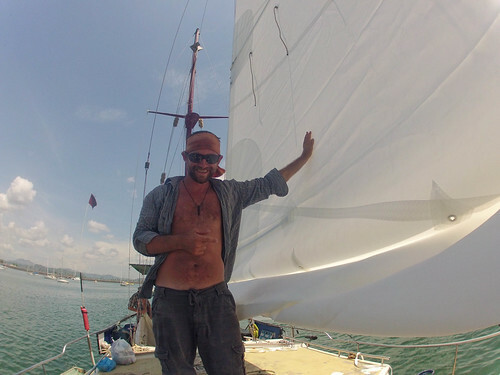 Louis, a young French Canadian from Sherbrook Quebec who joined in Santa Catalina while Karaka passed through when I was working out at Coiba. Unfortunately I never got to greet him nor meet up with the rest of Karaka when they passed through because there was a short burst of good wind that they needed to use so when I got back from my kayak trip they were gone. Elena, from Bulgaria I met through couchsurfing when she contacted me at the end of March in Santa Catalina. She had already been traveling for almost two years from Europe, Asia, Australia, NZ, South America and was planning on spending six months traveling Central America. Elena expressed an interest in sailing but had no experience and never thought it would be possible for her to be a crew on board a boat like Karaka. I had a good vibe about her so I mentioned to her that we needed one more crew for the trip to Polynesia and filled her in on all the details the first night she stayed with me at my apartment in Santa Catalina. She thought long and hard about the Karaka opportunity that I explained to her. 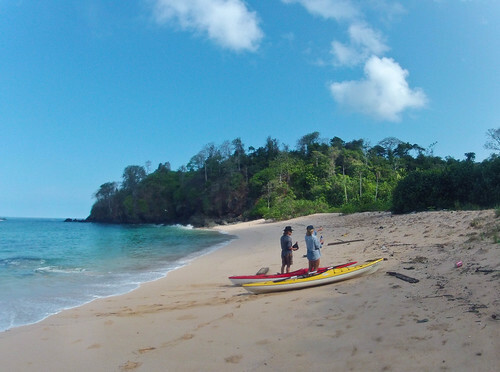 The next day, I left for an overnight trip to Coiba and returned late the following day. That night she told me she had connected with Tom already and was keen on coming aboard with us and that was that. So that makes us 7: Tom, Pam, Michaela, Louis, Elena, Steve, and myself. So the idea is for all of us to stay on board for about 5 months and when our sail arrives and all our provisioning is done we will set sail from Panama City and head out to the open Pacific heading south of the Galapagos to catch the right currents and trade winds that will take us all the way to Polynesia. It would be nice to go and check the Galapagos but it is way too expensive and the procedures for yachts is very complicated so we will have to skip it and spend more time in remote areas of Polynesia. French Polynesia is divided into 5 different island groups: The Marquesas, the Tuamotus, the Society Islands, the Gambier, and the Australs. Most people heading from Central America go directly to the Marquesas Islands, which are steep, lush volcanic islands. Our plan is to head straight for the remote eastern Tuamotus which are remote atolls covered in white sand and coconut palms protected by giant coral reefs. Many atolls have clear passage at certain times to enter into the center of the lagoon and enjoy safe harbour for a while. In the eastern Tuamotus there are very few visitors and the authorities do not patrol many atolls so we can hopefully delay our check in and experience life with a remote community. Tom is from France and has a permit valid for 18 months in Polynesia but most of our crew including myself can only get a visa for up to 3 months then we have to leave. So the longer we can delay our check in time the more freedom we have to stay longer. Eventually we will have to leave either by plane or boat from Tahiti. Our tentative plan, which will probably change, will be to head to the remote atoll of Amanu in the eastern Tuamotus, spend as much time as we like there then head to the Marquesas, check in and spend time enjoying those islands and then make our way to Tahiti through the western Tuamotus Islands to make landfall in Tahiti sometime in September so we all have time to figure out our flights and/or find other boats heading further west across the pacific. As for myself, I am really hoping to find another boat from there to other islands further west like the Cook Islands, Samoa, Tonga, Fiji, Vanuatu, New Caledonia, Solomon Islands, New Zealand etc and eventually end up in Australia. I have purchased a fully refundable flight for about $700 CND with Air New Zealand from Papeete, Tahiti to Aukland, New Zealand for September 15th. Other crew have done the same or bought non refundable tickets to their homelands. This will make it easier when we check in if we all have plane ticket receipts to show the authorities and we will not have to post a bond. I have already been in touch with a few different boats heading further west so i should be able to find another boat and cancel my plane ticket and get all my money back except a $25 service charge. So that is that and now we are all together finally and ready to go shopping. We did several trips to all sorts of different supermercados buying all our non-perishable provisions. We started off buying lots of cans of vegetables, sugar, oats, pasta, rice etc. We took care of some personal things and bought lots of snacks, booze and the like for the trip because we all knew it was going to be long and once in Polynesia everything was going to be a lot more expensive. Some of us even bought lots of extra booze, cigarettes, machetes, Shampoo, Guitars etc to sell or trade in Polynesia. Tom particularly has invested in a lot for resale in Polynesia for this 18 month stay. Within the first few days we had a pizza party and invited some couchsurfers. Some of us also went to Portobello and Isla Grande with them for a day on the Caribbean side. It was interesting to see experience the vibe on the Caribbean side, see different fish and coral while snorkeling too. 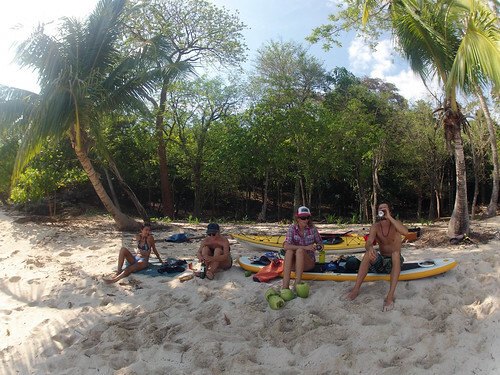 I circumnavigated 4 Islands by kayak with other Karaka crew during days while anchored in the Isla Perlas: Isla Bayoneta, Isla Gibraleon, Isla Pedro Gonzales, and Isla Viveros. Our final anchorage was a beauty! off a small islet south of Isla Viveros there was this small little palm filled beach with beautiful rock formations all around the island. The north coast of Viveros is quite developed and lots of construction happening there too. We went and checked out what looked liked an abandoned hotel construction site on the far north peninsula of the island. We struggled to get back with more engine problems and ended up tacking back and forth against a north wind. We anchored off one of the northern islands that was quite developed, Isla Contadora. That night we ended up running through a fishing net that night and getting it caught in the propellor but the gear box was still overheating as well as we tried to motor north against the wind the next morning. We tacked back and forth again not making much progress towards Panama City. It was getting dark again but we were close to Isla Chepillo. We anchored off the southern point of the island for the night. We were nearly out of fresh water in our tank at this point because we did not plan for it to take us so long to get back to Panama City. Steve and I kayaked into the fishing village and got some about 60L of fresh water from the Police folks watching over the village in the evening. Friday May 10th we finally made it back to Panama City with a nice light wind by mid-day. Karaka’s new main sail was in and we tested it out and it looks beautiful. Tom is so happy the main sail finally arrived! 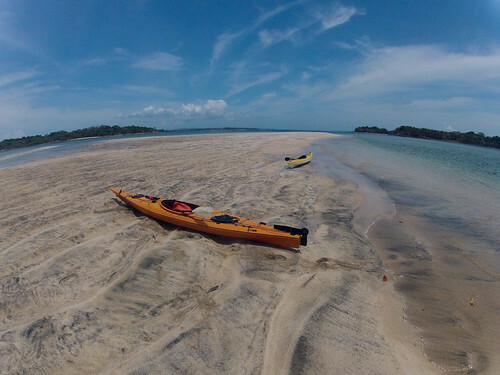 This entry was posted in Sailing, Sea Kayaking and tagged isla perlas, kayaking, Panama, Sailing by zkruz. Bookmark the permalink.